Have a question on Vantage? Vantage is available in 25 different colors - Lightning Silver, Hammerhead Silver, Kopi Bronze, Silver Blonde, Mariana Blue, Ocellus Teal, China Grey, Cobalt Blue, Marron Black, Stratus White, Midnight Blue, Jet Black, Sunburst Yellow, Quantum Silver, Diavolo Red, Selene Bronze, Morning Frost White, Concours Blue, Sea Storm, Silver Fox, Arizona Bronze, Volcano Red, Skyfall Silver, Appletree Green and Hardly Green. Watch latest video reviews of Aston Martin Vantage to know about its interiors, exteriors, performance, mileage and more. Being the trademark brand of the fictional character James Bond, the Aston Martin models are the all time favorite of any car enthusiasts. Founded in 1913, this British luxury sports car manufacturer has enjoyed a long period of success since its set up and still the legacy continues. Unveiled as concept at 2003 North American International Auto Show, the Vantage was first introduced as the production model at the 2005 Geneva Motor Show. In order to give a transform to this Aston masterpiece, the brand is out with the refreshed version of the Vantage. Notably the leanest and most agile car of Aston's line up, the Vantage stays a bit high in aesthetics as well as performance. Dramatic body styling of the Vantage conveys a message of sportiness and comfort all in the cabin. Handcrafted from the finest materials, the Vantage holds a glorious interior, that makes the driver feel driving a mean machine with luxury all around. Full grain leather seats with Piano Black centre console makes you feel dipped in luxury. Power assisted steering wheel comes with paddle shift attachment that delivers a pure sports car feel and enhances the acceleration by offering brisk switching of gears. Organic electroluminescent (OEL) display of the Vantage is rigged with almost all informations required during driving. 160 W Aston Martin audio system of the Vantage comes with windows media player and MP3 compatibility that avails you with quality acoustics. Class leading boot space of 300-litres is ample enough to settle useful amenities. Widely acclaimed design of the Vantage is the result of fine proportion, stance and sculptural virility. Traditional grille styling of the Aston Martin throws a sense of power and aggression it is bestowed with. Unadulterated figuration and minimal overhangs given to the Vantage shows refined and dynamic engineering done to it. Designed to evoke the sporty trait in it, the Vantage is bestowed with low bonnet lines and broad haunches at the rear. Though preserving the rare cohesion of the coupe silhouette, the roadster still manages a tantalizing body attributes. Holding a measurement range of 4382mm-4385mm X 1865mm-2022mm X 1241mm-1260mm, the Vantage fits in the roadster and coupe skin. Standard 19-inch alloys of the Vantage accommodates an all-season Pirelli and an optional Bridgestone tyres. This hand-built sports car is available in eight exotic variants under the coupe as well as roadster body style. All having an S trim level signifies that it also comes in a full sport variant. Housing brutal V8's and V12's, the Vantage booms out delivering a maximum power range of 420 bhp to a breathtaking 565 bhp that too between 6500 rpm to 7300 rpm. Rear wheel drive train accompanying a limited slip differential is served with a rubber burning torque range of 470 Nm to 620 Nm (between 5000 rpm to 5750 rpm). Grunting out with such a high powered engine, the Vantage hits a figure of 100 km/h in an incredible 3.9 seconds, at the same time the VH body structure with composite body material allows it to attain a top speed of 328 kmph. Though roaring with such a powerful motor it still delivers an astonishing mileage of 9.3 kmpl. Six piston mono bloc calipers at the front and 4 piston at the rear comes equipped with ventilated and grooved steel discs that offer consistent and high performance braking. Independent double wishbones to all the four corners ensures maximum stability of the vehicle while facing critical turns. In order to cruise at such a high speed obviously there is need of some efficient safety feature. Keeping this in mind the brand has loaded the Vantage with some decent features. VH body architecture of the Vantage has front and rear crumple zones that absorb the crash energy. Dual stage front air bags and inherent strong structure of the car offers ample protection in the event of accident. Traction control (Traction control) and dynamic stability control (DSC) offers maximum grip on the tarmac while propelling at greater speeds. Aston Martin Vantage is simply a supreme royalty, the very glimpse will make you fall in love with this beast. The Bond car, truly fits the tag, and is one of the most brilliantly crafted piece of machinery blazing through the face of earth. 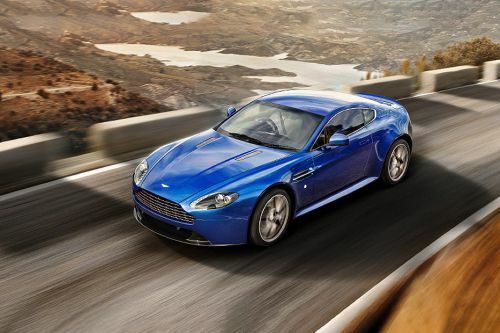 What are the colors options available in Aston Martin Vantage?